With a design philosophy that flouted trends in favor of his own whimsy, Geoffrey Beene marched to his own fashion drum. Lauded for his expert construction and skillful seams, his pieces were not without a touch of the unexpected. In the vein of Chanel and Patou, Beene would employ a simple jersey in the design of an evening dress and also looked to sports and activewear for fashion inspiration. A 1968 black beaded gown typifies the designer’s playfulness: An otherwise run-of-the-mill shimmery gown is emblazoned with a glittering gold jersey number, transforming the football uniform into an evening dress. 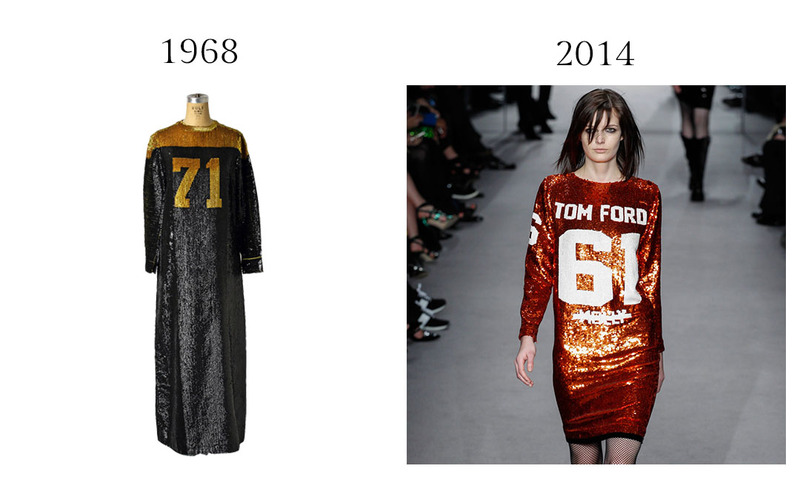 For Tom Ford‘s fall 2014 collection, the designer cited the 1960s and the Southwest as inspiration, sending down a pair of sparkling shift-dresses, also beaded in the style of a football Jersey — undoubtedly, a throwback to Beene’s well-known football frocks. Evening Dress by Geoffrey Beene, 1968, Housed at The Metropolitan Museum of Art.